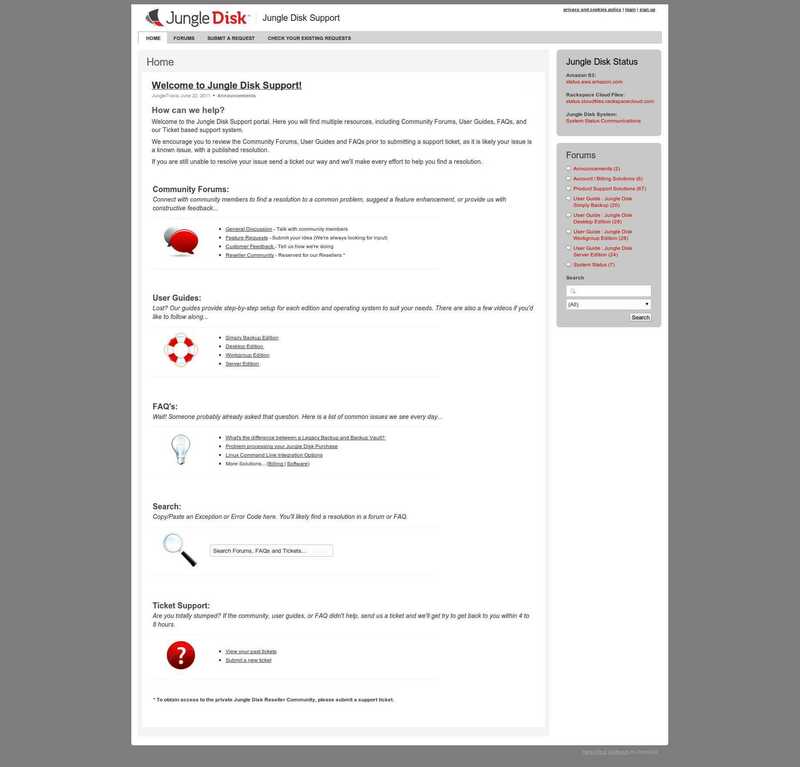 Jungle Disk is a strong contender in cloud backup industry, and a subsidiary of web hosting extraordinaire Rackspace. It packages its offers differently, with choices to store your data at either Rackspace or Amazon S3. But “pay what you use” pricing can be also confusing for normal home users. Read the full review below or if you want to, sign up now. 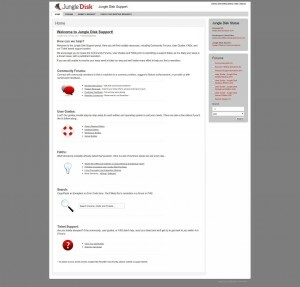 Among the cloud backup and data syncing service providers, Jungle Disk packages its offers differently than most providers do. The subsidiary of web host extraordinaire Rackspace allows you to choose your own storage provider – either Rackspace or Amazon S3, and also charge you only for the storage you use. There is no limit imposed on how many computers you use on your account either. The pricing maybe a little confusing at start, but when you really get your hands dirty and do the calculation (which I did for you, under Pricing Plans), you will find that Jungle Disk’s pricing is reasonable and comparable with the competition. The service is quite capable, and it really has good cross-platform compatibility. Unlike its competitors Carbonite and Mozy, Jungle Disk’s client software works really well on both Mac and Linux, not just Windows. The mobile apps are only available for iOS devices though. 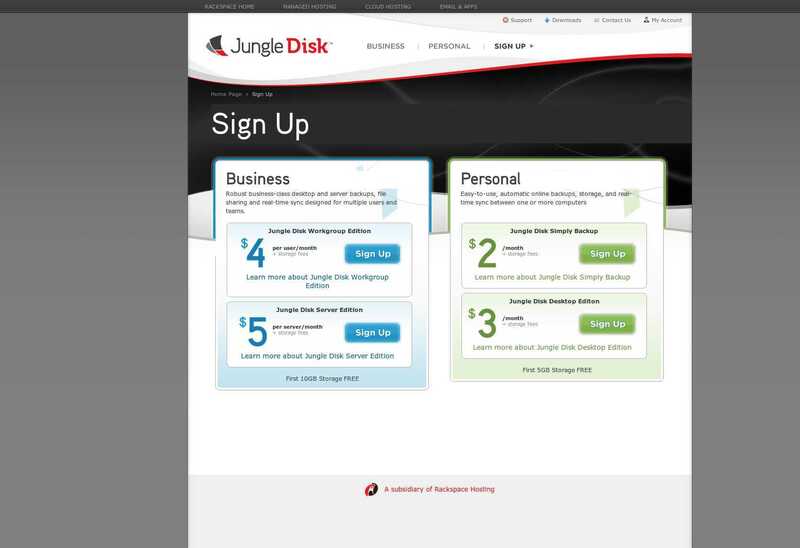 Jungle Disk’s pricing plan is in line with other cloud backup providers and it lets you pay for what you use. Nothing extra. Currently Jungle Disk offers two Personal plans and two Business plans. Simply Backup. $2/month + storage fees. 5GB free included. Simply Backup plan is for straightforward online backup only. Desktop Edition. $3/month + storage fees. 5GB free included. This plan includes not just online backup but also network drive and syncing. Workgroup Edition. $4/user per month + storage fees. 10GB free storage per user included. It has everything from Desktop Edition, plus a feature to sync data and collaborate between teams of 2 to 100. Server Edition. $5/server per month + storage fees. 10GB free storage per server included. This plan is specifically designed for servers, with all enterprise-level features that sysadmins will love. For storage, you can choose from either Amazon S3 or RackSpace. Rackspace charges $0.15 per GB/month while Amazon S3 charges $0.125 per GB/month. It looks like Amazon is a tad cheaper but in reality, it is not. Why? If you choose to go with Amazon S3, you will have to keep in mind that S3 will charge you for data transfer as well as data requests. The rates are as followed. Data Transfer. $0.12 per GB of data downloaded. No charge for uploading. Data Request. $0.01 per 1000 upload requests. $0.01 per 10,000 download requests. So in reality, Amazon S3 might be more expensive depends on how much data you are uploading and downloading. The difference maybe marginal, but I would rather go with Rackspace than to have a headache calculating my costs with Amazon S3. So how much all these really cost? Assuming you need about 50GB of storage and going to backup 3 computers, then you only need to pay for 45GB since 5GB is included as free for personal plans. Then your monthly cost is $2 (Simply Backup plan fee) + $6.75 ($0.15 x 45GB) = $8.75. Then for 12 months, you will be paying about $105. If we calculate the storage alone, that’s $81 a year. I would say the pricing is still in sync with other competitors like SOS Online Backup, which cost $79.95 for the same scenario. CrashPlan and Mozy would cost $120, and Carbonite will set you back $165. So the pricing is definitely fair. Pay What You Use. This is not a feature but more of a design of what Jungle Disk offers. Although there is no unlimited option, you are only paying for what you use. Backup unlimited computers. Unlimited here is more of a virtual quantifier, since you still got to pay for the storage. But Jungle Disk won’t limit you on how many computers you can backup. This is a good thing since most of us own more than one computers. Cross-platform compatibility. 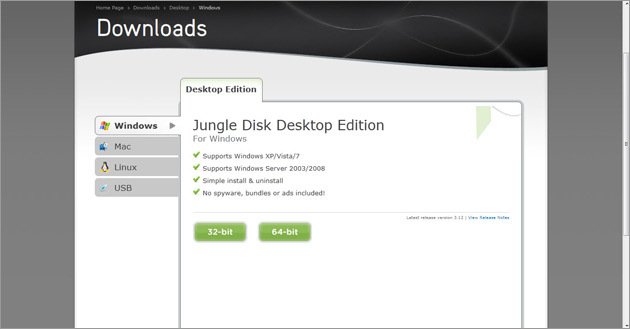 Jungle Disk’s client software is made to work for all three major OSes – Windows, Mac and Linux. Unlike Carbonite, Mac and Linux clients aren’t treated as second-class citizen. The client software functions the same on all OSes. There is an app for iOS devices too. Android app is still in work. Network Drive. If you have Desktop Edition from personal plans or any of business plans, then you will get access to network drive, which basically is your backups at Jungle Disk in a form of network drive on your computer. It’s faster than WebDAV too. Syncing. Simply Backup plan doesn’t have it but other plans will enjoy syncing feature which is similar to Dropbox. However, it will only work when you have network drive option enabled. Remote Management. 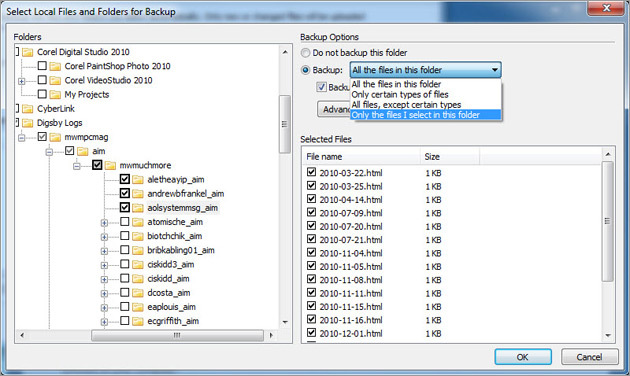 If you have Server Edition backup plan, then you can remotely manage your backups from any PC, Mac or Linux. Backup Vaults. Basically, these are block-level de-duplication and compression. To illustrate, they are quite similar to incremental backups of other providers. If you chose Amazon S3 as your storage provider, then these backup vaults will save your data request and transfer fees. Even if you chose Rackspace, these will save your time in backups. Jungle Disk is mainly a software service which stores your data on Amazon S3 or Rackspace servers, so your data are protected by Rackspace or Amazon. Their facilities are quite amazing and since both are well-known players in this space, their security is no less than of Google. On the software part, Jungle Disk uses 256-bit AES encryption which is what the government is using. If you choose high security option, you can even choose your own encryption password, which is a plus. The guys at Jungle Disk deserve lauding acclaim for their support system which meets customers in three tiers. Okay, that may be an exaggeration, but Jungle Disk’s customer support is pretty darn good. First one is a pretty active community forum. This allows customers to ask and consult on tech issues they have with other customers as well as Jungle Disk’s staff. I find it savvy to source answers from fellow users than from the FAQ. Next thing is the Frequently Asked Questions (FAQ) section. To be perfectly honest, their FAQ covers most stuffs, but I feel the forum is a better choice. However, I suggest you take a look at the FAQs before asking a question which may have been asked and answered a thousand times before. If all these fail to give you a solid answer, you can shoot straight to the resourceful User Guide. The User Guide is, in my honest opinion, pretty comprehensive and covers most issues you will encounter and also answer a lot of questions. Now, if none of the above makes a satisfactory case for the help you are looking for, then prepare to bring out the big guns and sends a ticket to customer support using the support system. My experience with them is not so fast, but then I sent a ticket at non-US business hours so maybe it’s due to that. It took 4 hours for my question to get back a response. Signing up to Jungle Disk is easy. You just have to choose a plan you want on the home page. After signing up, you can download the installer software for Windows, Mac or Linux. Once installed, you will be taken through a 4-step wizard, which involves signing in, creating an “online disk”, selecting the features and configuring an automated backup. After singing-in, you will be asked to choose either Rackspace or Amazon S3 as your online storage provider, when you are at Create an Online Disk page. Then you will have to choose between standard security and high security. If you choose high security, you will have to set an encryption password that only you know. Be ware though, since if you choose this option, your files will be encrypted at local machine before backing them up to the server. It’s good feature fr high security, but it also means that Jungle Disk’s staff will not be able to retrieve your files should you ever forget your password. The next step will have you choosing three major services: Automatic Backup, Network Drive, and Sync. If you only signed up for Simply Backup plan, then Network Drive and Sync won’t show up at all. And if you want Sync, then you also need to enable Network Drive. After that, you will have to choose the folders you want to backup. This is pretty standard affair. There is an Advanced Options dialog which lets you enter wildcards to exclude folders and files. For Network Drive, you can choose drive letter just like your local hard drive, and you can even drag-and-drop files into it. Pretty neat feature, I must say. There is a maximum cache size you can set, which helps in minimizing network traffic. 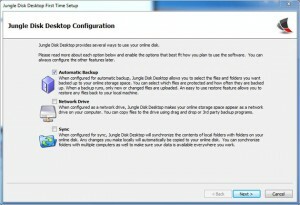 You can access to this network drive from any other computers with Jungle Disk software installed and same account logged in. After that, you can pick Sync folder, which you set one folder for syncing. 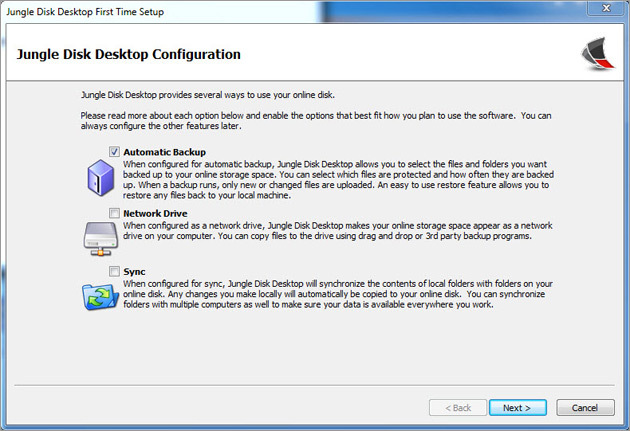 Unlike Dropbox which creates its own folder for syncing, Jungle Disk will let you choose a folder of your own. You can specify the file types to sync. Then all you have to do is wait for the initial backups to happen. You can actually change the backup processing too. By default, it is a daily occurence. But you can change it to weekly, 6 hours, 1 hour, 15 minutes or even 5 minutes. I would say it gives you pretty much good control. Heck, you can even make the Jungle Disk software to wake up my computer from sleep for a scheduled backup. Now I don’t have to stay awake until 2AM for that daily backup! Jungle Disk software is pretty straightforward but quite good and solid. Initial backups of 1GB was estimated at around 5 hours but it was recalculated as my connection speed goes up and down. There is a jungle out there in online backup providers industry. Jungle Disk has loads of competition. But its software and services are well-thought-out and capable. The data syncing, network drives, Backup Vaults, and choices in storage provider all make it a flexible provider. However, it also makes it more unnecessarily complicated than necessary. For normal backup users, services like CrashPlan maybe more expensive if you are doing backups for multiple computers but it has lesser complications. The distinctions between Network Drives, Backup Vaults and Sync drives are good enough to confuse any end users. Not a good thing, in my opinion. Pricing model is also a double-edge sword. While it lets you pay for what you use, now you are going to have to worry about how much you are backing up rather than knowing you have certain space limit, and just set & forget it. If you choose Amazon S3, then you are definitely in luck. You are going to have a headache with calculating data transfer and request costs as well. But all in all, I really think Jungle Disk is a good option, especially if you are familiar with technical jargons. I will recommend it immediately for any business users since Workgroup Edition gives good controls for users, as well as syncing. It would be also suitable for tech savvy users. But for most home users, I would say other services like CrashPlan are better served. Jungle Disk is now an independent company, spun off from Rackspace. They are hard at work improving an already excellent service. I don’t think it is unreasonable to ask customers to delete their online disks. Deleting backups is a serious step. It should be neither too easy nor too hard. With Jungle Disk, it is an extra step, but it is not too hard. 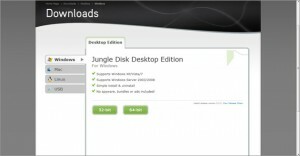 @Lynne – Jungle Disk retains backups of versions and of deleted files for the period you set when creating the backup. They also support point-in-time restores. I agree, though, that you should maintain local backups, too. Redundancy is an important part of any disaster recovery plan. I don’t work for Jungle Disk. I am a satisfied customer. Jungle Disk is by far the worst online backup solution. It’s exponentially more expensive than let’s say Carbonite. Their customer service is horrible. At best some of their business practices reflect poor management and reflect their anti-customer-centric attitudes. At worst their business practices are lawsuit worthy. Take for example what it takes to “close” your account: No phone number to speak to someone, chat only. Instructions are poorly written (not step by step and you have to figure out what the instructions mean). Then you can “close” your account but if you don’t delete all your drives, then you continue to be billed. Huh? Who pray tell would close an account but yet want to continue to be billed for storing data? Maybe someone would want to “archive” data but that is not “closed”. This policy alone shows how lazy and short sited the staff are in this organization are. Save yourself a lot of aggravation and give someone else your hard earned money. make sure you are doing a secondary, local backup. Jungle Disk is not doing full backups so if you lose a file they cannot provide the full file. They only back up altered files. This has had a significant impact on our business and we have moved off of JD. Their support is ineffective at best and we were informed that we must have deleted the file which in fact, it literally disappeared in the middle of the day. No data, no recourse. Jungle Disk has reduced their support for Linux. The jungledisk desktop doesn’t work right under Ubuntu 13.10 and they only working on supporting Ubuntu LTS. This may change, but as of November 2013, I can’t recommend Jungle Disk for Linux. I use them to back up my servers as rackspace, which is pretty convenient since they are the same company. No complaints.